a) Be eighteen years of age or be or have been married. b) Be of sound disposing mind. Paragraph a) is reasonably clear. Paragraph b) is more interesting. i) A person must understand that he or she is making a Will, i.e. that it is a document that will dispose of their assets on their death. ii) The person must be capable of knowing the nature and extent of their estate, i.e. their property. This includes land, houses, shares, bank accounts cash etc. iii) The person must be able to consider persons who might be expected to benefit from their estate and to decide whether or not to benefit them. It should be noted that despite the well-worn phrase “being of sound mind and body” there is no requirement regarding physical health when it comes to making a Will. It should also be noted that the law recognises that a person may have a “lucid interval”. For example a person may have a mental condition affecting their capacity some or even most of the time. However if the condition is such that at times capacity returns, a Will made during one of these periods would be valid. When a solicitor is making a Will for an elderly or infirm person it would be quite normal to ask the person’s medical practitioner to meet with the person first and give a report as to their mental state. Not having such a report does not invalidate a Will but having such a report is a good way to avoid potential disputes. 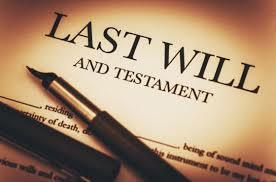 Once a person executes a Will in accordance with the legal formalities regarding witnesses etc. set out in the Succession Act it is presumed by law that he or she had capacity. It is therefore up to anyone challenging the Will to offer evidence in Court and prove that the person did not have capacity.